We had a pleasant start down Swap Canyon on a meandering gravel wash surface. It was cold and windy but warm when the sun hit us. After an hour or so we emerged out of the canyon into colourful views of the waterpocket fold and its multiple pinnacles of rock. What happens here is that all the colourful layers of sandstone that are usually horizontally stacked on top of one another have tilted upwards. The plateau we were moving over is sloping up. 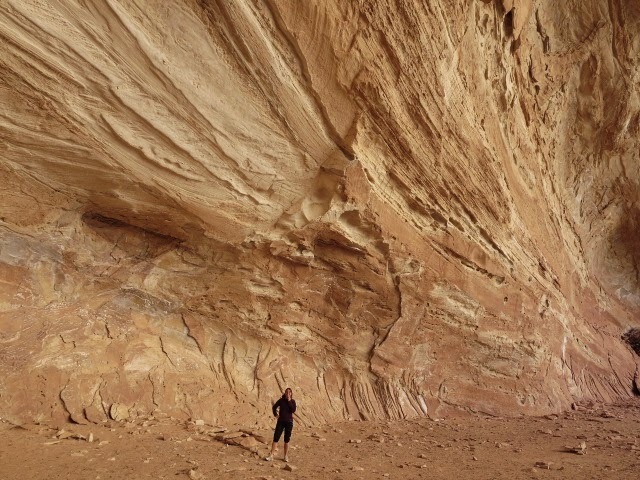 Erosion creates deep canyons full of colour and reflected light- like ‘sleeping rainbows’. 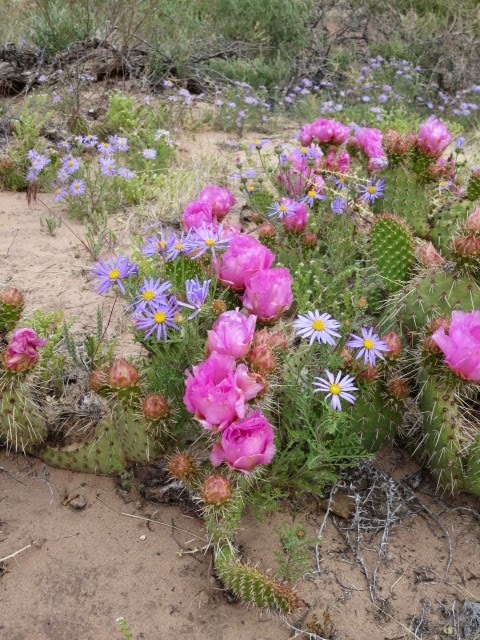 After the snow and rain from the past days the desert was blooming. Temperatures were still mild and a fresh wind blew us gently along. 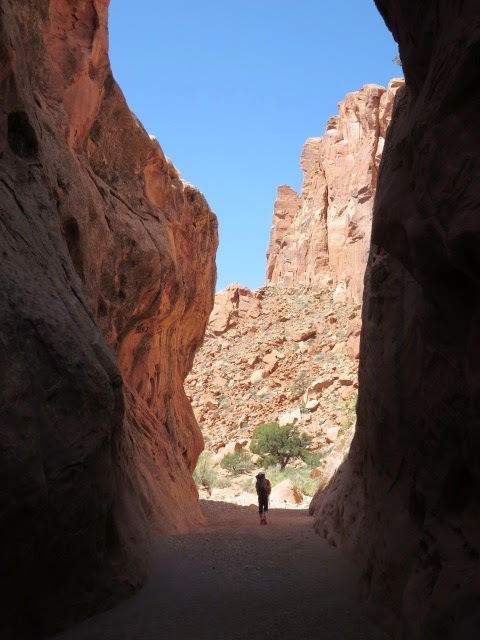 Our route took us onto the dirt road of the Burr trail which zig zagged upwards under huge sandstone walls. Expansive views opened up eastwards back the way we had come to the Henry Mountains. At the top we hit Capital Reef National Park, the Lower Muley Twist Trailhead and signed the trail register. Surprisingly we saw that another Hayduke hiker had been here two days ago- Micheal Geiss. 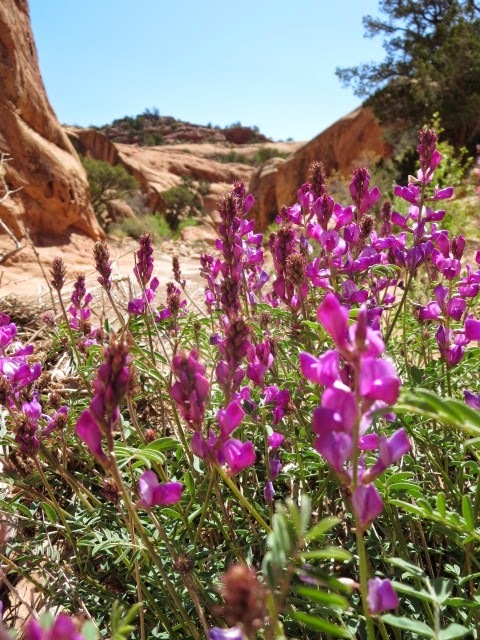 Since we hadn’t met any other long distance hikers yet (and hardly any other hikers at all) we looked forward to seeing if we could meet him – perhaps in our next intended town stop of Escalante. We did meet an English couple staying in Calgary a few minutes into the canyon though and enjoyed a chat with them, before we headed between the amazing sculpted sheer rock walls of Lower Muley Twist. Further on the twisting canyon had some fantastic deep alcoves (or alcaves as we called them) -bigger than we had ever seen. The 8 miles down the canyon were tremendous with lots of variety overall. We stopped at ‘Cowboy Alcove’ – complete with some old food tins and graffiti- for a break before the canyon dropped east through lovely narrows and exited out into the wide expanse of Halls Creek. 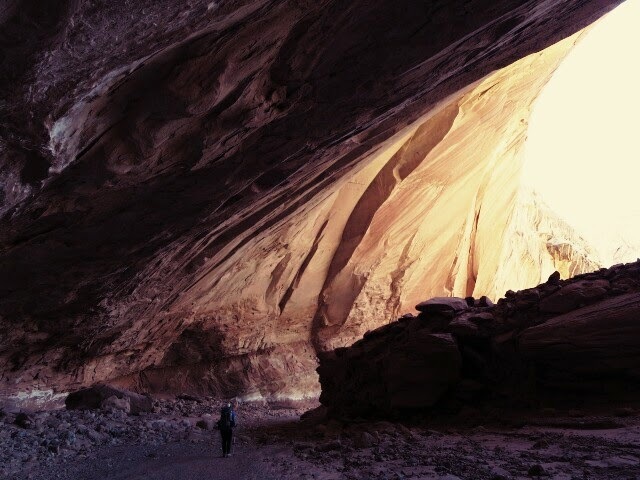 Here the canyon was less dramatic but still scenic with maroon wingate sandstone domes. Our destination was some huge pools of water called Muley Tanks lying a few hundred meters west of the canyon bottom. We struggled to find them though, and had to double back and search around for them. It was worth it though as the pools sit in an idyllic spot on sandstone slickrock. Our feet were sore but it was a great end to the day and we set up camp a few hundred meters away under a juniper tree. After studying our maps we decided to divert from the Hayduke route again and take an alternate down Halls Creek and Stevens Canyon over the next 2-3 days. It looked scenically fantastic in Stevens (we had visited the lower part of the canyon in 2004) and the alternate would avoid the normal Hayduke route’s.long 25 mile wade down the Escalante river. Halls Creek was initially dry and sandy and was wide open in complete contrast to yesterday’s narrow canyon. The going was fairly good – a gravelly sandy base- and the views were ever changing. We found a single track trail on the east side of the wash that took a more direct line than the meandering river for much of the way. 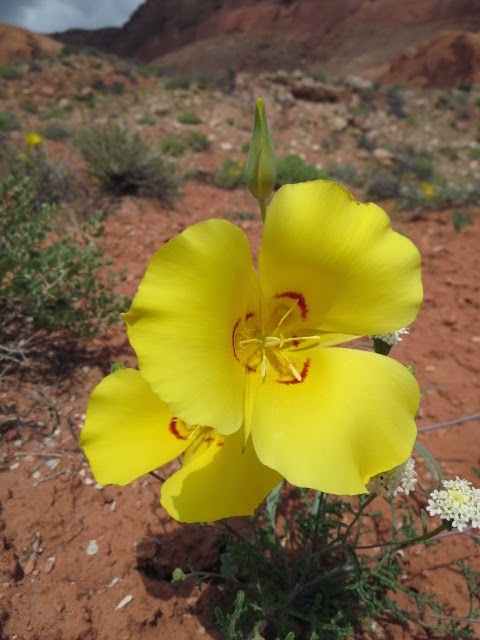 It also took us through some of the loveliest desert flowers we have seen! Pink cactus, yellow lillies, purple lupins, white primrose, some orange flowers, sages- contrasting with a deep red soil. Further south, water surfaced and into the afternoon we hit thicker scrub and bushwhacked through bamboo like willow and other tangled vegetation. We resorted to just hiking down the river for a while and some spots of quicksand kept us alert! The quicksand we came across wasn’t particularly dangerous especially with a partner to help pull the victim out! Once you emerge from the quicksand you end up with thick clinging goo over your shoes and socks though which can be hard to clean off. Our campsite was beside the river in halls Creek nestled against a red sandstone dome, about 2 miles short of where we aim to climb out of the valley over into Stevens Canyon via a disused route called the Baker Trail. One of the tent zippers at the front failed probably due to the excessive sandy, dry conditions- bummer (we have a otherwise wonderful Terra Nova Voyager)!